Police and National Bureau of Investigation (NBI) operatives allegedly found in SPO1 Adonis Dumpit’s possession 15 medium-sized sachets of shabu with a street value of P90,000 and a. 45 caliber pistol, which was not registered under his name. It was not just the National Bureau of Investigation that had information which identified slain SPO1 Adonis Dumpit as a “narco cop,” as Bohol’s top NBI agent said that they collated data from various police units, including the Bohol Criminal Investigation Detection Group (CIDG), which supported the allegation. “Na collate na nato ang mga information gikan sa CIDG Bohol, sa PNP regional office. Naa na silay information nga ang subject [Dumpit] narco cop. Klaro g’yud na narco cop,” said Bohol NBI provincial director Atty. Renan Oliva. According to Oliva, the NBI intervened when the Bohol Provincial Police Office (BPPO) reported that Dumpit allegedly threatened one of the police officers who arrested Sergio Tajanlangit for alleged sale of illegal drugs on May 25. Dumpit allegedly tried to convince the team leader of the police unit which arrested Tajanlangit to downgrade the charge against the suspect to possession of illegal drugs from sale of the banned substance, which is a non-bailable offense. “Nagsugod ni kadtong naay mi-file og complaint, gi-endorse diri sa Bohol Provincial Police Office…na patabangan nila og verify kay di sila ganahan mo imbistegar kay involved police. Magpatabang sila para walay bias so ni-apil mi, ni-assist mi og imbestigar,” said Oliva. 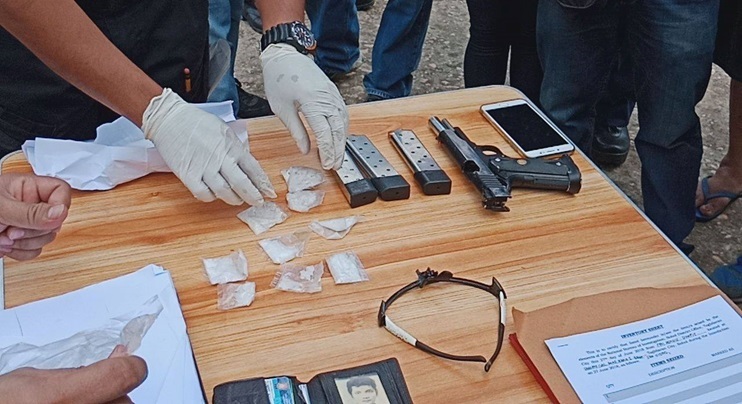 The NBI official told media that Dumpit, a known crime buster and a “good” cop, may have been introduced to drug personalities while incarcerated at the Leyte Regional Penitentiary (LRP). Meanwhile, Dumpit’s live-in partner, Ma. Ella Amores, refused to believe that a shootout erupted during the operation against the veteran cop. “Sa dihang paglakaw niya, ingon siya nako nga ‘adto nako love’, ingon ko ‘sige amping, diri ka maniudto’, mitubag siya nga ‘mobalik lang ko.’ Seconds lang, naghaguros na ang sakyanan Montero ba to o van unya diha nay buto-buto,” said Amores. Amores also refuted authorities’ claim that Dumpit was in possession of illegal drugs as she said that she was the one who prepared his pants where police and NBI agents allegedly found 15 packets of medium-sized shabu. “Nakuha na nila ng tawo, pakapinan pa gyud ug makadaut sa iyang pagkatawo,” said Amores who also told media that she was unaware of any illegal activities that Dumpit may have been involved in. According to Oliva, the operation against Dumpit was legitimate and was not an ambush. Dumpit was placed under surveillance by the NBI and the police since June 19.